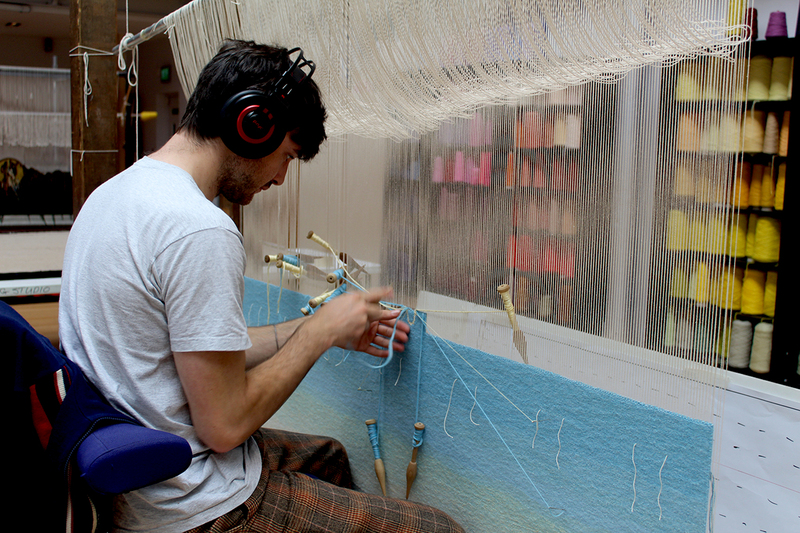 Ben Hymers, Dovecot’s Apprentice Weaver has completed his three-year apprenticeship, with his promotion to Junior Weaver to be marked by the cutting off of a tapestry he has woven with guidance from Master Weaver Naomi Robertson, translated from a watercolour by HRH The Prince Charles, Duke of Rothesay. The tapestry Abandoned Cottage on the Isle of Stroma, Caithness will be displayed on Dovecot’s Tapestry Studio Viewing Balcony from Friday 24 November as part of an exhibition to highlight Ben’s apprenticeship. The completed tapestry, which took Ben eight months to weave, depicts a watercolour by His Royal Highness painted in Scotland. HRH supported the project by generously giving permission for his watercolour to be translated.